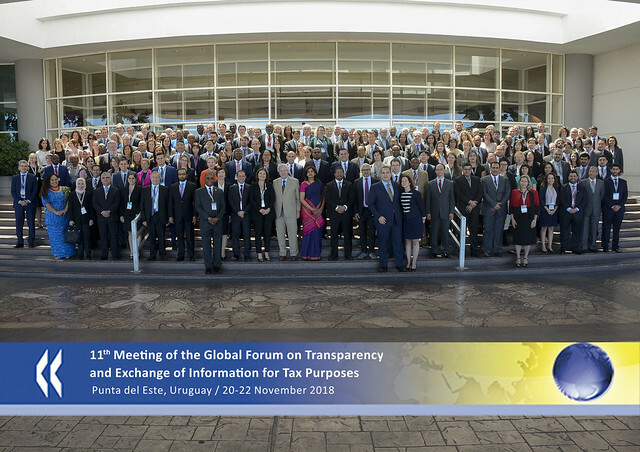 22/11/2018 – The Global Forum on Transparency and Exchange of Information for Tax Purposes held its annual meeting in Punta del Este, Uruguay on 20-22 November, bringing together over 200 delegates from more than 100 jurisdictions, international organisations and regional groups to strengthen further the international community’s fight against tax evasion. The meeting marked the widespread rollout of automatic exchange of financial account of information. Global Forum members took stock of the tremendous progress made in the implementation of the standard of automatic exchange of information (AEOI) with 4 500 successful bilateral exchanges having taken place under the new AEOI Standard in 2018 by 86 jurisdictions. Each exchange contains detailed information about the financial accounts each jurisdiction’s taxpayers hold abroad. Such widespread exchange was also facilitated by the use of the Common Transmission System managed by the Global Forum. Further details can be found in the 2018 AEOI Implementation Report. Following its review of the legal frameworks, the Global Forum will move to assessing the effectiveness of the AEOI Standard in practice. To this end members adopted a detailed Terms of Reference for such reviews and a work plan further develop, test and refine its approach to conducting the reviews, which will commence in 2020. The Global Forum also published a further 22 jurisdiction reviews this year in relation to the exchange of information on request (EOIR), which has only increased in relevance with the move to AEOI and transparency initiatives in relation to base erosion and profit shifting (BEPS). In other developments at the meeting, Global Forum members commended the technical assistance work carried out to support jurisdictions in implementing the standards effectively. This work has grown enormously, and is a truly combined effort of the Global Forum, donors, other international organisations and regional groups, working together towards a common goal. The Global Forum delegates also welcomed the Punta de Este Declaration which sets up a Latin American initiative to maximise potential of the effective use of the information exchanged under the international tax transparency standards to not only tackle tax evasion, but also corruption and other financial crimes. This improved international tax cooperation will help counter practices contributing to all forms of financial crimes and improve direct access to information of common interest to all relevant agencies. The next plenary meeting to be held in 2019 will mark the 10th anniversary of the Global Forum. This will be a key moment to reflect on the role it has played in the effective implementation of the tax transparency standards across the globe and its future direction.